2 or more: $24.45 ea. 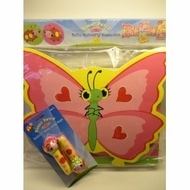 This adorable Melissa & Doug Sunny Patch Bella Butterfly HOPSCOTCH will bring your child loads of hoppin' good fun with 8 interlocking durable foam pieces, 2 markers and durable carrying case. Also included, is a Melissa & Doug, Mollie & Bollie Jump Rope with comfortable wooden handles featuring a super cute lady bug with pink jumping rope!